Saturday’s fight card in London heralded the arrival of a new player in the world heavyweight scene – Anthony Joshua. Joshua has hardly flown beneath the radar until this point – that’s not been possible given his heavyweight gold medal from the London 2012 Olympic games. That said, last weekend’s fight against Dillian was his first serious test in the pro ranks, and it proved a very entertaining and gripping fight. The fight had a great backstory, with Whyte beating Joshua in his very first amateur fight. Genuine dislike and bad blood had permeated the build up. Until his fight with Whyte, Joshua had things entirely his own way in the pro ranks, never going past the third round, and knocking out all fourteen of his opponents. Against Whyte, it looked in the first round that this fight could be more of the same, with Joshua landing heavy shots from the opening bell, and Whyte hanging on for dear life. At the end of the first, mayhem broke out when Joshua landed a shot momentarily after the bell. Whyte saw red and launched himself at Joshua, and was lucky that he wasn’t disqualified. In reality, the extended break required to calm things down was probably a godsend for Whyte. The second started with Joshua again having the better of things. Midway through the round, Joshua appeared to think Whyte was there for the taking and started swinging, leaving himself open to a huge counter left hook from Whyte that would have dropped most fighters in the division. Whyte later claimed that he injured his shoulder with that shot (more on that later), but he continued to have success for the rest of the second, with Joshua looking heavy-legged and dazed. 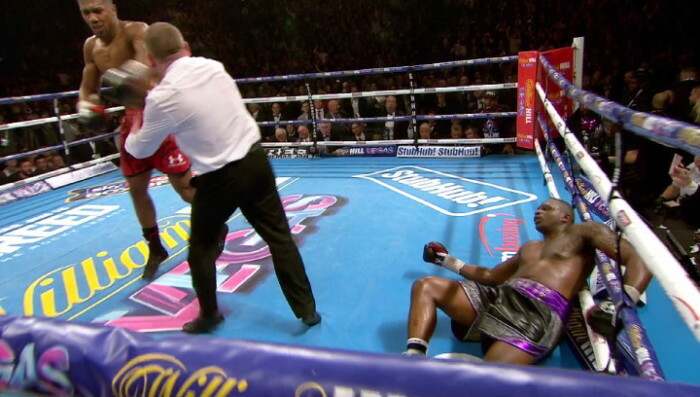 Whyte arguably edged the third round, with Joshua still appearing a little out of sorts. From that point on, it was all AJ. Joshua found his range quickly in the fourth, and by the end, Whyte’s body language was starting to look negative. The role had reversed – Joshua was initiating everything and landing accurately, whereas Whyte had been doing so in the second and third. Whilst Whyte continued to return fire and demonstrate a great chin, he didn’t landed few shots from the third, particularly clean shots. Early in the seventh, Joshua caught Whyte with a solid right high on the head, and around 20 seconds later landed a sickening uppercut that looked like it would have stopped an elephant. Where their careers in the pro ranks have differed however, is the speed they have been nurtured. Whilst Wilder has been widely criticised for the level of opposition he has faced, Joshua appears to be less risk-averse. So – Joshua appears to be pursuing his career with more risk and urgency than most every heavyweight on the scene. When reflecting on the Whyte fight – this was no easy win for Joshua. He had to struggle, his chin was seriously tested, and he was taken well into uncharted waters. He was staggered in the second round, lost the third (at least on my card), and had to adjust in order to win. As a result, he gained invaluable experience. Briefly returning to Wilder – it’s interesting that he’s not had any equivalent ‘learning’ fights prior to fighting for the title, and I’d argue the same applies in his two voluntary defences since. I wonder whether not having had a fight like Whyte prior to defending a title may prove an issue for Wilder. Most titleholders have been challenged prior, and I’m intrigued to see how Wilder copes with adversity from this point. Joshua himself acknowledged after the Whyte fight that he needs more experience and more rounds before he’s ready to step up to world level. That’s almost certainly true. Whilst he has shown great potential thus far, he’s presently a work in progress, and will need to study the Whyte fight to iron out the opportunities Whyte managed to exploit. I reckon in around 18 months (by which time I’d expect Joshua to have had around 20 fights) he might be ready. That’s a pretty rapid learning curve (as was Fury’s 24-0 record at the point he defied the odds against Wladimir Klitschko). I wonder what the scene will look like by then. Who knows whether Fury or Wilder will still be titleholders. If they are though, a fight with Joshua against either would be a tantalising prospect. For Dillian Whyte’s part, I don’t think the loss to Joshua will do him any disservice, other than possibly render him being seen as a high-risk and low-reward proposition. Dillian claimed after the fight that he should have a rematch as he was carrying an injury to his left shoulder which went after the shot that stunned Joshua momentarily in the second round. Having watched the fight a few times, I have an issue with this claim, since Whyte went on to throw left hooks until the sixth round, and whilst they generally didn’t connect he didn’t appear to be in any way pulling the shots. Paulie Malignaggi even noted that he attempted the same left hook in the sixth that he’d had success with in the second. Nevertheless, Whyte needs to rebuild his career before that’s liable to be an issue, unless one of the top heavyweights want to throw him a quick bone, but I’d be surprised if that was the case.